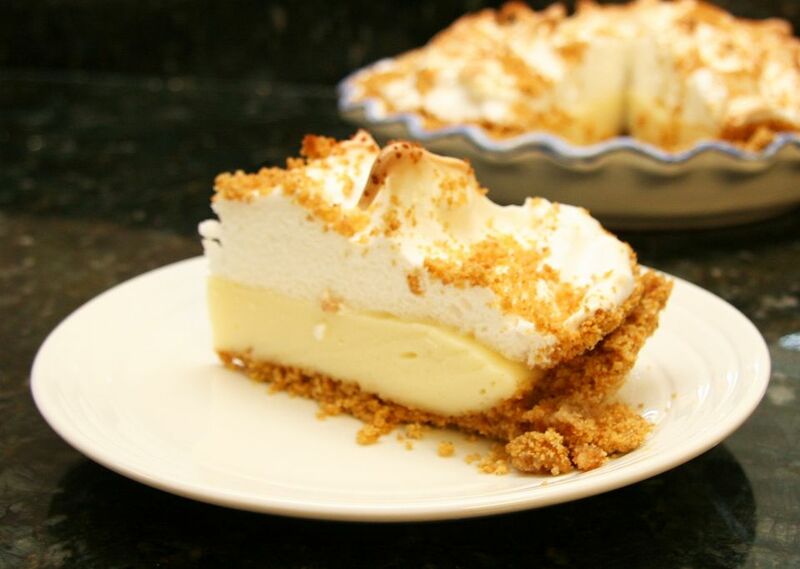 A graham cracker pie is made with a vanilla custard filling, a graham cracker crust, and a topping of meringue or whipped cream. Graham cracker crumbs are sprinkled over the topping. This graham cracker pie reminds me of a pie my Aunt Irene made for special occasions. This version of the recipe is made with a meringue topping, but it can also be finished with a fresh lightly sweetened whipped cream topping or a ready-made whipped topping. Store this pie in the refrigerator for up to 2 days, loosely tented with foil. In a medium bowl, combine the graham cracker crumbs, butter, and 1/3 cup of the sugar; mix to blend. Set aside 1/4 cup of the graham cracker mixture. Pat the remaining graham cracker mixture into a deep-dish pie pan. Bake the crust for 10 minutes. Remove the pie crust from oven and set aside to cool. In a heavy, medium saucepan, combine the 1 cup of granulated sugar, cornstarch, and a dash of salt. Whisk in the milk and egg yolks, then place the pan over medium heat. Cook, whisking constantly until the mixture begins to thicken and gently boil, which will take about 5 to 6 minutes. Continue cooking, whisking, until very thick, about 1 to 2 minutes longer. Remove from heat and whisk in the 2 tablespoons of butter, a few pieces at a time. Stir in the 2 teaspoons of vanilla. Pour the hot filling into the cooled graham cracker pie crust; set aside. While the filling is still hot, make the meringue. In a mixing bowl with electric mixer, beat the egg whites at high speed until foamy; add the cream of tartar and gradually add the 6 tablespoons of sugar; continue beating until stiff peaks form. Stir 1/2 teaspoon of vanilla into the egg whites. Gently spread the egg-white mixture over the top of the custard. Sprinkle with the reserved 1/4 cup of graham cracker mixture and place in the 325 F oven for 12 to 15 minutes, or until the meringue is browned. Chill the pie for at least 4 hours before serving.